From August through to October is flight time for Heterotermes, and each year home owners report seeing damage in gyprock, damage in skirting board timber, damage in window frames and cornices. 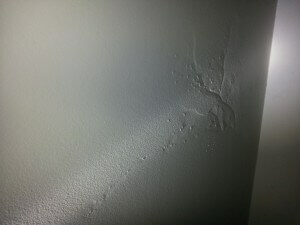 Tiny trails can be seen eating out the gyprock/ plaster wall behind paintwork. Whilst the new reproductive caste of termites grow their wings and darken in colour, worker termites will excavate tunnels throughout the gyprock, gaining height in preparation for termites to release flying termites inside the home. When you see termites fly, you will quickly notice how incompetent they are at doing so which is why it makes perfect sense w hy termites gain height in the wall ready for launch. Cloaked under the guise of other termite species, these little guys can get away with murder. They are prison snitches, always pointing the finger at other termites. There are a few clues which can break down the alibi. Heterotermes pack their galleries with hard mud, sometimes even filling in the work of aggressive species like Coptotermes or Schedorhinotermes. The numbers of workers can seem relatively low and their actions are positively sleepy compared with the constant motion other species are in. Damage occurs more slowly but it occurs none the less. 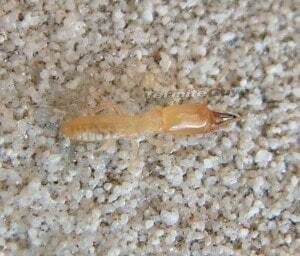 Heterotermes are frequently found in close proximity of other species of termites. It is possible that they have in fact subverted other species or are living amongst them without repercussion (why would competing species of termites co-operate over food sources?). In rare cases this could be beneficial; hijacking aggressive species while they are attacking a house could actually slow the rate of damage. More commonly innocent types like Microcerotermes are taken over instead.The absence of large numbers (or any numbers at all for periods) can make conclusive identification problematic. It also hinders efforts of initial treatment, such as dusting or baiting. Skirtings and trims often appear quite warped or bubbly when these guys are responsible. Behind the paint there is more mud than gallery as they continue to munch away. The paper lining on the back of gyprock is another favourite. Termites can make quite a racket as they move in with large numbers. People often report hearing clicking, and ticking sounds in the walls as they lie in bed. Termite soldiers make a distinctive ‘rattle’ sound unique to species when they are disturbed. Click this link to listen to Termites vibrating their heads in the wall – heterotermes. The sound is made by termites vibrating their heads against the timber which gives them depth perception and is also used as feeding and warning signals throughout the colony.  If you think you may have found evidence of termites, you should read our Termite Treatments Page or contact Termite Guys now to arrange an thorough and professional inspection. 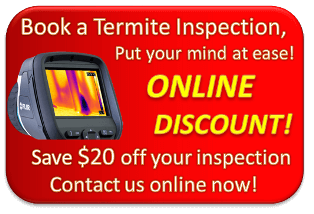 For a $20 discount off your termite inspection please use fill out your contact details on our contact us page and a technician will contact you as soon as possible.